How To Catch The Silver Robber (Dwarf Tiger) On Fly? The Silver Robber (Dwarf Tigerfish) is a small shoaling fish that is very aggressive and has been nicknamed the miniature Tigerfish or Dwarf Tiger. A lot of people ask the question, what is a Dwarf Tiger? The answer is, it’s this freshwater fish species, the Silver Robber. It get’s it’s nickname of the Dwarf Tiger from the colouration it has, (As can be seen pictured here) it’s ferocious feeding habits, and the tiny sharp teeth this species has. 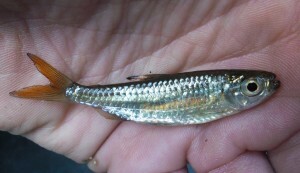 It makes it look exactly like a miniature Tigerfish. The Silver Robber is in the same family as the Imberi, and these two species are often confused. The Imberi is not the Dwarf Tiger fish that we talk about, as many people may think. The photograph of the Silver Robber (Dwarf Tiger) above is courtesy of Christopher Caine from Fishweights. The Dwarf Tiger, also known as the Silver Robber, occurs in the lowveld habitats in the northern regions of South Africa. They can be found throughout all the rivers in the Kruger National Park as well as places like Vaalkop, Loskop Dam and Lake Jozini. There is a healthy population in the Pongola (Phongolo) River and around most of the warmer reaches of KwaZulu Natal, Mpumalanga and Limpopo. The Silver Robber (Dwarf Tiger) prefers clear flowing water, although it is just at home in calmer large waters, like dams for example. They are an aggressive fish that will often feed on insects on the surface, which makes it an exciting micro species for casting those tiny dry flies at. The Silver Robber (Dwarf Tiger) breeds throughout the Summer months and can attain a length of 10 centimeters or so, and they generally can live up to 4 years or so. Fly fishing for this Robber species can be exciting. Once you locate the shoals of these fish, all you need is a small wet fly, and retrieve it through the school and you will be in for a lot of fun. The hardest thing to do is to find them. They often hold up around structure like submerged trees and plants. You can also try your like at targeting them on Dry fly and small nymphs.